Jews prayed together in Columbus beginning in the 1840s, and in 1848 they formed a congregation with lay-led services held in private homes. In May 1849, Friendship Cemetery was established by the Independent Order of Odd Fellows. In 1850 Jews create a special section of the town’s Friendship Cemetery for Jewish families known as Covenant Cemetery. Finally, in 1879 the congregation began construction on a synagogue building. “We have sufficient people to support a congregation and sufficient means at our command without depriving ourselves of the smallest comforts of life. With time the community did organize. Columbus Jews opened a Sunday school in 1877, a year before they first met to discuss the possibility of creating a congregation. I. Bluhm was elected president of the fledgling congregation, and the board created a finance committee whose purpose was to raise contributions from larger Jewish communities on the East Coast. Such support for new “frontier” congregations was common in the 19th century American Jewish life. From its founding, B’nai Israel was Reform in practice, although it did not join the Union of American Hebrew Congregations, the national organization of Reform Judaism, until well into the 20th century. In its early years, B’nai Israel charted its own course of religious practice, distinct from both classical Reform Judaism and from traditional observance. From their founding, B’nai Israel adopted Isaac Mayer Wise’s “Minhag America” as their mode of worship. Not long after they formed, they hired Joseph Herz as rabbi at a salary of $25 a month. They also hired a music and choir director and purchased an organ. An early board motion passed requiring the rabbi to wear a kippah, but the board voted down a motion to make him wear a tallit. The young congregation rented a building from the local Odd Fellows society, which they used as their house of worship for almost thirty years. In 1880, they dedicated their synagogue at a public ceremony attended by Columbus’ Jews, elected officials, clergy, press, and circuit court judges. Soon after, B’nai Israel had 39 members, though there were several Columbus Jews who had not joined the congregation. Most of these unaffiliated were young men without spouses or families; non-members were charged $2.00 for seats at High Holiday services. In 1882, Jewish women formed the Ladies’ Hebrew Benevolent Association of Columbus. Mrs. T. Loeb served as president, Mrs. L. Weiman, vice-president and Mrs. L. Fleishman, secretary. During its early years, B’nai Israel experienced economic hardship. The congregation cut its dues to attract new members, created a “detailed account” of all congregants in arrears, and suspended those with outstanding debts. In June of 1884, B’nai Israel raffled off a clock in an attempt to raise money, and in 1885 the congregation was forced to reduce the rabbi’s salary from $400 to $300 a year. As early as 1891, members began to raise money for the construction of a bigger synagogue for the congregation. Because of their small size, and the high rate of turnover of, B’nai Israel was not able to purchase or build a building of their own for several more years. By 1897, the congregation had shrunk to only 15 households, and the board began to recruit members from such neighboring towns as Starkville, West Point, Aberdeen, and Macon. In 1904, a group of Jews in Aberdeen successfully organized and petitioned B’nai Israel to join the congregation. 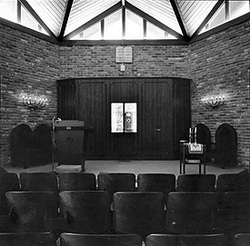 B’nai Israel thus became a regional congregation, which it continues to be today. The congregation continued to raise money for a permanent house of worship. They even solicited and received a $100 donation from New York financier Jacob Schiff. At the 1906 annual meeting, congregation president Simon Loeb exhorted the members to “stand up for their religion and put their shoulders to the wheel” in the fundraising effort. In 1906, when the congregation was without a space to hold services, several local churches offered B’nai Israel free use of their facilities. B’nai Israel accepted the kind offer of the Christian Church, and donated a new carpet to the church as thanks for their generosity. In December of 1906, the congregation voted to purchase an old building in town for use as a temple. Built in 1844 as a Methodist Church, the building had been a military hospital during the Civil War, a private military school, a city gymnasium, and a community concert hall. 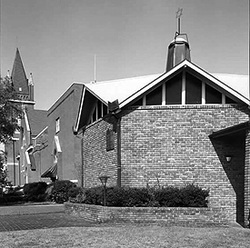 Upon purchasing the building for $2,400, the congregation began a program of renovations, transforming the former church into the synagogue that would house them for the next 53 years. The temple was dedicated in 1908. Rabbi Brill of Greenville led services. In a description of the dedication one author credited the “untiring efforts and devoted loyalty,” of the ladies of the congregation for ensuring its completion. At that time, the congregation numbered over 200 families. After Rabbi Herz’s death, Sol Schwab, a B’nai Israel member and dry goods merchant, served as spiritual leader of the congregation. For several years, the congregation functioned with lay leaders rather than an ordained rabbi. During this time, B’nai Israel adopted two war orphans from Europe with the Congregation supporting them as a whole. In the 1939, they hired Rabbi Bernard Adler. Although B’nai Israel’s members remained committed to their community and charities, the synagogue’s financial situation became unstable again during the Great Depression. The Jewish population of Columbus had dropped to sixty. The temple’s executive board revoked the memberships of many members, even synagogue trustees, who had ceased paying their dues. It implored its remaining members not to renege on their payments and to attend services more frequently. In 1931, they were forced to suspend their choir since it was too expensive to maintain. The situation reached its nadir in 1940 when they were unable to continue paying Rabbi Adler, relying instead on a visiting rabbi once a month. Finally, the opening of an Air Force base in Columbus in 1942 brought new prosperity to the congregation. Columbus Jews were closely involved in the town’s commerce, owning seven retail stores, a shoe shop, two theaters, an insurance agency, and a garment plant that employed over 1,000 people. As a result, the influx of over 8,000 troops to the area proved especially beneficial to the Jewish community. B’nai Israel’s recurring problem with congregants in arrears vanished, as years of unpaid dues came pouring into the synagogue. The treasury balance grew from a paltry $13 in November of 1941 to over $3,000 in March of 1946. They were now able to afford a full-time rabbi and hired J. Spear for the position. Taking advantage of this newfound prosperity, B’nai Israel revamped its temple building and purchased new sets of prayer books. The congregation also threw its support behind the Zionist movement. Following the war, it spearheaded a food drive for Jewish settlers in the fledgling state of Israel. A new challenge emerged in March of 1946, when the congregation voted overwhelmingly to fire their unpopular rabbi and replace him with a new one. The hiring committee took a year and a half to find a new rabbi; it finally hired Dr. Louis Kuppin in November of 1947. Kuppin remained at B’nai Israel until 1962. He also taught in the music department at the Mississippi State College for Women, located in Columbus. Since Rabbi Kuppin’s retirement, B’nai Israel has employed a long series of student rabbis from Hebrew Union College. 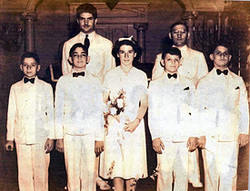 Many simchas were celebrated, such as the first confirmation class in 1961 for David Smith, Rachel Berman and Michael Kleban. The congregation celebrated its first bat mitzvah in 1968 with Karen Katz, daughter of Ralph and Carolyn Katz of Starkville. In the spring of 1980 Gregg Adam Fine was the first bar mitzvah. As with other small town Temples, membership decreased but B’nai Israel remains vibrant because of its membership activity, especially with new industry coming into Columbus. Congregation member Dr. Seth Oppenheimer serves as lay leader for the rest of the month. There are 40 member families that live in Columbus and other nearby towns. Despite the difficulties that have befallen the members of B’nai Israel over the decades, their dedication to provide the Columbus area with an active synagogue never faltered, and the congregation remains today as a testament to their hard work. “Columbus, Miss.” The American Israelite. April 14, 1877. “Columbus, Miss.” The American Israelite. Dec. 1, 1882. “Congregation B’nai Israel history” (Columbus, MS, 2005) Columbus Mississippi file. Institute of Southern Jewish Life archives.